When Reggie was a boy living in Washington, D.C., in the 1960s, his father was a senior member of both the Kennedy and Johnson administrations. One of the perquisites of his father's position was that he was supplied with a car and driver for his sole use during the week. In addition to picking my father up at our house in Cleveland Park every morning and dropping him off again at the end of the day, the driver—whose name was Henry—would also ferry my father around town to meetings, do minor errands for him, and take him to and pick him up at the airport when he traveled out of town. When Henry wasn't attending to my father's transportation needs, he spent most of his time at the garage of the federal office building in which my father worked, hanging out with the other drivers, and polishing his car, of which he was extraordinarily proud. And he had every right to be, because it was—in retrospect—a true beauty. 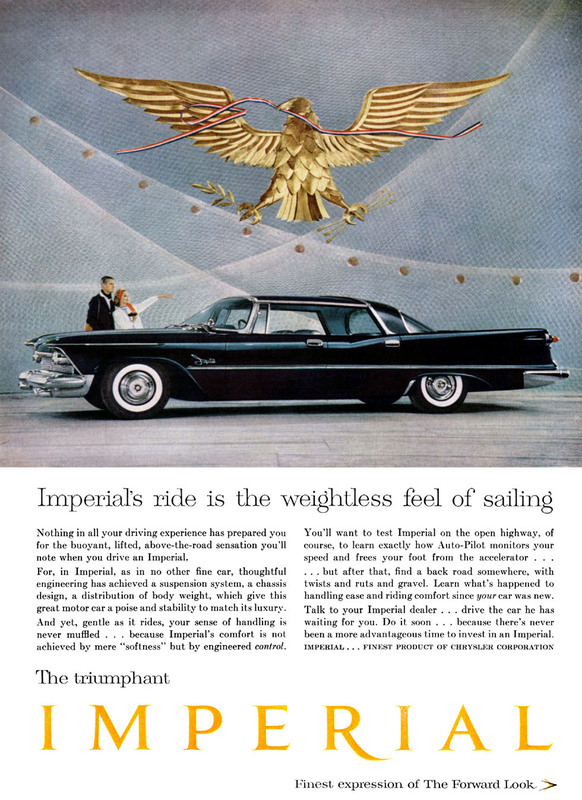 Henry drove an ocean-liner-size, black-and-chrome, four-door 1958 Chrysler Imperial. For readers who are younger than Reggie, and who may not be familiar with the Imperial brand, it was the Chrysler Corporation's luxury marque brand and was positioned to compete directly with General Motors' Cadillac and Ford's Lincoln brands. 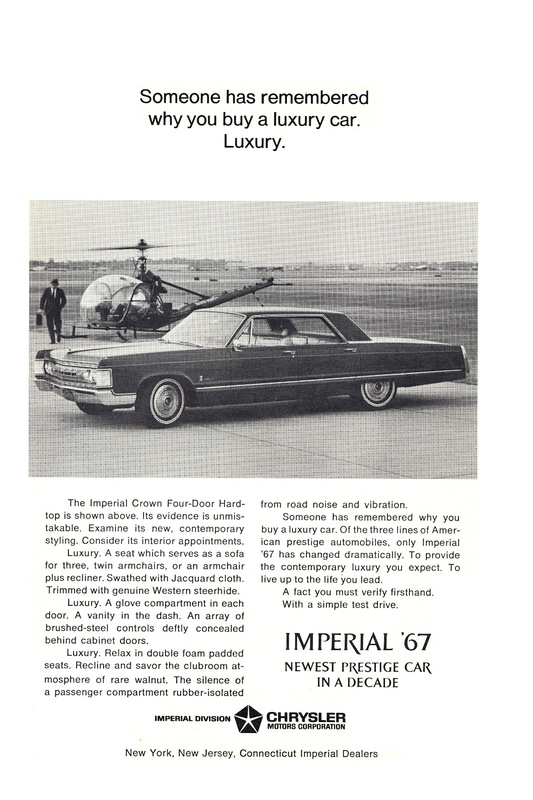 The Imperial's heyday was from the late 1950s through the 1960s. 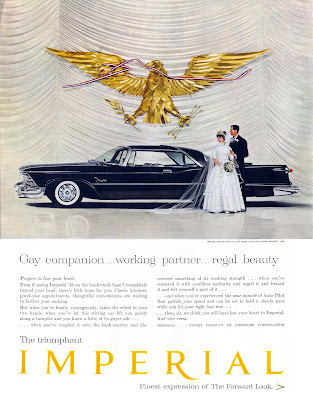 In addition to driving my father around town on business, Henry and his 1958 Imperial were also available during working hours for my father's personal, non-business related use. That included ferrying members of my family around town, too, from time to time. My mother, MD, would occasionally use Henry's services when she went out on an afternoon's shopping trip or to a ladies' social gathering. She would also sometimes have Henry pick me or my siblings up at school or at friends houses after a play date, at least when she was otherwise engaged. I doubt that in today's far stricter times such personal use of government property and services would be allowed, but in the mid-1960s it was unexceptional, and expected. It was, in reality, the norm for quite a few of the children that I went to school with and played with, many of whose fathers were also senior government officials or appointees. Having a car and driver available to these men and their families was part of the package. In the fall of 1966, when I was ten years old, I got carried away by having seen a Disney movie called "Almost Angels" about the Vienna Boy's Choir that was shown on Walt Disney's Wonderful World of Color, and I auditioned for and was accepted into the Washington National Cathedral's junior boys' choir. This required attending the choir's weekday practice sessions and Evensong service performances in the Cathedral's Bethlehem Chapel. Although the Cathedral's campus was but a few blocks from our house in the Cleveland Park neighborhood of Washington, my attendance at the choir's rehearsals and services was complicated by the fact that I was enrolled in a country day school in Virginia at the time, about a forty minute's drive away. On the days when the choir was not in session I took a school bus to and from the country day school, but on the days when the choir was in session it required that someone pick me up at the school in the mid-afternoon and deliver me to the Cathedral's campus in time to attend the choir's sessions. At first this task fell upon my mother, who came and picked me up on the two afternoons a week that the choir was in session. However, she soon began to chafe at this commitment and decided that it would be far more convenient and preferable for Henry, my father's driver, to pick me up at the school and drive me to the Cathedral's campus instead. As a result, Henry and I came to know each other rather well. Henry called me "Master Reggie" and I called him, well, "Henry." This was, after all, the mid-1960s, and south of the Mason Dixon line. I enjoyed being picked up at the school by Henry in the Chrysler Imperial and driving into the city and to the Cathedral campus in the large, shiny black car, sitting in the back seat wearing my school uniform and talking with Henry in the front, who would be wearing his uniform of a black suit, white shirt, black bow tie, and chauffeur's cap. That is, until Freddy Fonsworth, a rather mean-spirited classmate of mine, saw me being picked up one day. The next morning, in front of my other classmates, he loudly exclaimed that the car I was being picked up with was grotesquely old and laughably out of style, and that only a "stupid jerk" would ride around in such a car. I felt the hot flush of embarrassment when he said this. It had never occurred to me that the car, which was almost nine years old at the time, was so out of date versus what everyone else was driving then (this was back in the day when most affluent Americans kept their cars for no more than two or three years at a time). But once Freddy pointed it out to me I knew immediately that he was right, and that Henry's Chrysler Imperial was an outmoded, out-of-date, fin-bedecked embarrassment. The next day, when Henry picked me up at the school, I asked him why it was that he drove such an old car, and wouldn't he prefer to drive a newer, more modern model? He responded, "Why, no, I wouldn't, Master Reggie, because there ain't no finer car than this here Imperial. They don't make 'em like this anymore. My manager keeps tryin' to get me to take a new car, but I turn him down every time he asks, because I love this car. I don't ever want to have to give her up." "Mummy, why don't you pick me up at school anymore, but rather send Henry to pick me up instead?" "Because it is more convenient for me to have Henry do it. Why do you ask?" "Well, I'd rather that you picked me up instead of Henry." "What? I thought you of all people would enjoy being driven around in a chauffeured car! What's the matter with Henry?" "It's not Henry . . ." I said, trailing off. "So what's the matter, then?" she asked. "It's that the car he drives is so old and weird looking, and it embarrasses me to be seen being picked up by it at school." My mother rolled her eyes and snorted, and said, "For Chrissakes, Reggie, what's the matter with you? That car is the love of Henry's life and he's very proud of it. It's a wonderful car! You should be grateful that you are picked up at school and driven to choir practice by Henry—like some little Pasha. I am not going to pick you up at school simply because you are embarrassed that Henry doesn't drive a later model car. Forget it!" And so I did. But I never quite got over my embarrassment at being picked up at school and dropped off at choir practice by Henry in his enormous 1958 Chrysler Imperial. And I felt ashamed of myself for feeling that way, when Henry was so obviously proud of his car and his profession as its driver. By making fun of me in front of my classmates, Freddy Fonsworth had succeeded in sucking all the fun out of my trips with Henry, and I came to no longer enjoy them, as I was convinced that every time I got into the car's back seat I was followed by a chorus of derisive laughter from my schoolmates as they saw me drive away in the ancient, contemptible Chrysler Imperial. I lasted only a year in the junior choir, before dropping out and resuming my normal school-day routine and traveling back and forth to school on its regularly scheduled school bus runs. I only rarely was driven by Henry thereafter, usually in the company of my mother or my father. Within a year or two my father left the Johnson administration and returned to private practice, which brought to an end his days of having a car and driver assigned to him to ferry him and his family members about town. Today, when I see school children at Manhattan's private schools being picked up by drivers after school in black shiny cars, I recall my own experience and think how fortunate I was to have been regularly picked up at school by Henry in the afternoons when I was in the Cathedral's junior choir. And I kick myself for not appreciating at the time how fortunate I was, and that there would come a time all too soon in my life when I would only dream of having such a car and driver at my disposal. I got a chuckle out of the headline to this advertisement! Particularly if it were a triple-mint condition, perfectly maintained, gleaming black and chrome 1958 Chrysler Imperial, with Henry in the front seat prepared to take me wherever I wanted to go . . .
All vintage Imperial advertising courtesy of the Online Imperial Club; the vintage postcard is from Reggie's own collection. Ah, the good people can learn lessons even in privilege. As an aside, have you told us, do you still sing in any choruses? 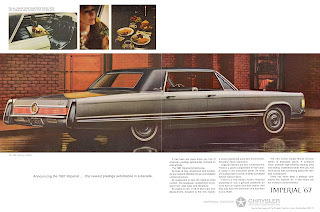 I spent many summer hours driven around in a 1968 Chrysler Imperial by my petite, chain-smoking grandmother, running errands. I didn't mind the smoke because the air conditioning was absolutely frigid, and having the whole backseat to myself was like being driven around in my own private living room. Too bad about Freddy Fonsworth--one in every crowd, I'm afraid! T&CM: Yes, the air conditioning was extremely powerful, I recall. That Freddy was a fink! Perhaps even a rat fink! Yes, Emmeleigh, he was a rat fink! I do miss the cars that put emphasis on style and comfort. Now all you hear about is engineering and fuel efficiency. These are good things and I believe we have to use less gas and just drive less whenever possible. But having grown up in an era of large, elegant cars with simple, powerful engines, it's difficult not to feel nostalgic about them. My mother ferried us about in a large Oldsmobile station wagon and we all felt safe (seatbelts? what seatbelts?) In my 20s I drove a 1964 Bel Air, which got about 8 miles to the gallon and was over 19.5 feet long - 4 feet of which was empty space under the hood- just for looks! It was easy to maintain, beautifully designed, and it was great to drive- power everything! After many years of schlepping gardening supplies and paintings, it was sold to a couple of girls in a punk rock band in San Francisco and I still see it on the road from time to time. I can't see anyone will ever feel that nostalgic about a Prius. About this same time, our neighbors across the street had a 1964 Chrysler Imperial convertible. It was off-white with a matching soft top and a burgundy leather interior. Although not the latest model, I thought it was so good-looking! TDC: Your neighbors' Imperial sounds divine. Wouldn't that be fun today? This post made me sad or perhaps wistful is better. Do you still know your school mate? the Imperial was we used to car a Yank Tank, but a gorgeous looking car! A very young Reggie would doubtless have been much happier at STA. But an older Reggie, returning nightly to a deteriorating domestic situation, might easily have wished he was almost anywhere else. So this story is an important amendment to your recent post about St Throttlesex. You knew you were at a school that required your parents to move you elsewhere. It didn't come -- completely -- out of the blue. Perhaps your parents picked that school because it allowed you an opportunity to escape something they both felt was coming. Maybe they were, in their own way, looking out for you. 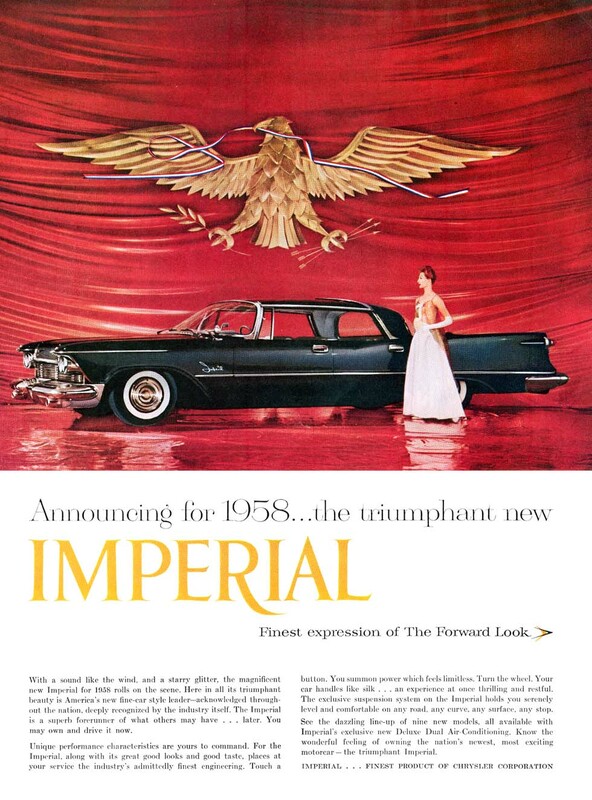 so much more elegant than all Father's Lincolns and Mummy's Cadillacs; that is until Father's 1961 Lincoln Continental took center stage in the neighborhood. I loved that car so much until the 1963 model appeared in the drive, and Mummy thereafter began driving Buick Riveria's. At the end of the decade a 280SL and 300SEL were fixtures in the drive. The great American luxo barges Henry so loved were slowly slipping away. I miss all those big land yachts! But I am happy not to have to trade automobiles as often as we once had to. I have to agree with Henry--the older model had a lot more personality. I always kind of liked older cars. When I was little, a family friend used to collect automobiles, and he would give us rides in them--classics from the Forties, and even older ones in which we got to ride in the rumble seats. Fun memories. My husband's family driver was appalled when he found out what kind of car I drove. Those were the days! I too was inspired by the Disney story of the Vienna Boys Choir. Unfortunately for my family and friends, the inspiration was to run around EVERYWHERE singing in a high falsetto with no provocation. The Dilettante could not then, and cannot now carry a tune in the proverbial hand basket, and this was one of the very few times in my life that my parents did NOT encourage my new interest. As to the Imperial Chryslers---oh the stories I have---including my grandfather's last, a very dignified boxy end of the line model. 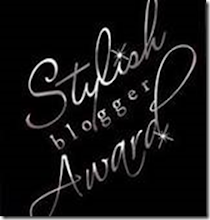 But this is your blog, so another day. Am I alone in thinking this post should have been titled 'Driving Miss Reggie'? Okay, DED, you get the blue ribbon for the funniest comment. I about "busted a gut" when I read your last sentence! Oh Reggie, what a cute story and so true. The things we used to worry about when we were young. 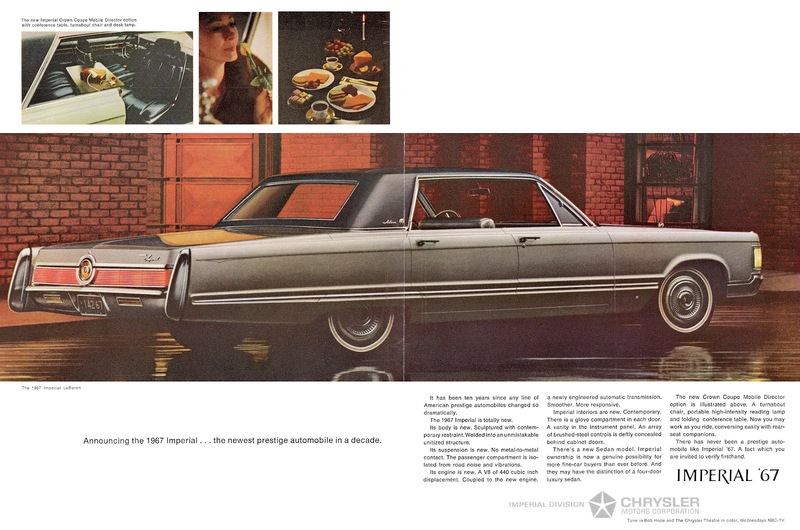 When we first arrived from Havana in 1961, my grandparents rode around Miami in their chauffeur driven Chrysler Imperial (light green). If I remember correctly, it had wheel or spare tire design on top of the trunk in the back. You could see that car from 3 miles away. When they came to visit us and I would be out in the yard with my hip teen age friends, the whole neighborhood would turn around and stare. Who are those people? my friends would ask. "oh just some friends of my parents" was my casual comeback. The funny part is they always bought Chrysler cars for they felt Cadillacs were too pretentious. I guess everything is relative. Hello Roxi: For some reason my reply never came through. So, here I go again...I love the diea of a light green Impreial, and that your grandparents thought Cadillacs were pretentious, which by then they were. Also laughed at how you explained who "those people" were to your friends. A hoot and a half! I very much enjoyed reading today's essay. Henry certainly knew a thing or two about stylish cars. Looking at the accompanying images to your post, it really does highlight the contrast in automobile fashions from across the pond , especially as it made me think back to the car our family owned at the time. While you were being driven around in an iconic American model of great length (how long were those cars? ), I was being driven (by my father) around town in his brand new nifty little cream colored Triumph Herald. What a difference in size to your Imperial! It did navigate the narrower roads of London rather well, at least I imagine it did compared to your Imperial. Prior to the Triumph, our family depended on the local Routemasters to get us around town. LizaE: Yes the contrasts across the pond were quite pronounced at the time. I had cousins in Surrey who drove a Rover four door sedan (at least the father did to and from his job in the City) that seemed rather diminutive to me when I visited them in the 1960s. My father's own personal car when Henry was driving him was an MG convertible, ca. 1960, that he adored, and which was much fun to ride about in (even though Freddy Fonsworth would still have laughed at me, as it was almost as old as the Imperial!). Reggie, truly wonderful post. The kodachrome-tinted memories of our youth define us in so many overt and imperceptible ways. This account made me remember vignettes I'd not recalled in many years. Cleveland Park has far less towncars these days although you see a few in the early mornings. Let the FF's of the world be damned. I regret not loving the rides with my grandmother because she drove her Cadillac Fleetwood with the price tag in the window (for years) and dressed like Endora from Bewitched and smoked cigarettes in a holder as well. Yeah, let the FF's of the world be damned. That poor bride in the last advertisement. She looks less than eager to step into the car, as if she has read the tag line beneath her feet and suddenly foreseen the unhappy road that stretches before her. 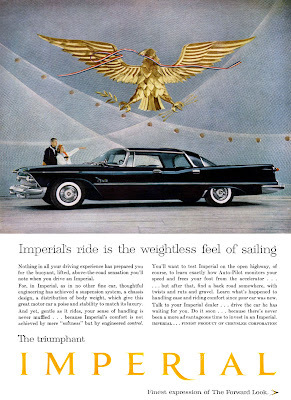 Perhaps she’s assessing the costs and benefits: “Do the comforts and prestige of driving an Imperial outweigh the quiet misery of being trapped in a marriage built on a lie?” If any road machine can handle this metaphor, it’s the mighty ’58 Imperial. I have always adored the Chryslers of the late 1950s. For a few golden years, America's #3 automaker ruled the road in terms of style, if not reliability. Chrysler’s design chief, Virgil Exner, was to automotive style what Diana Vreeland was to women’s fashion. 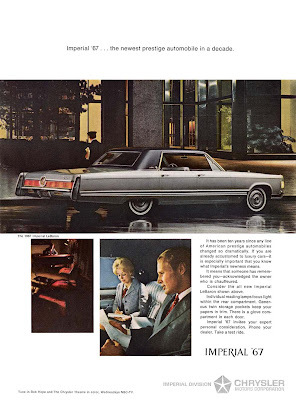 Unfortunately, Exner did not share Ms. Vreeland’s ability to anticipate and adapt to changing times, and by the early 1960s he had been relieved of any real authority at Chrysler -- a company managed by so many Freddy Fonsworths. Damn them. Damn the Freddy Fonsworths of this world. And bless the Henrys, who keep the faith. P.S. Last night I posted anonymously to your recent cliffhanger, as I had not come to your bog intending to comment at all. And here it is, only 24 hours later, and, as predicted, I’m back again, shamelessly breaching this morning’s waking vow to spend less time on the Internet.